Nigerian Biography: Biography of Paul Eneche; Pastor; Medical Doctor. Biography of Paul Eneche; Pastor; Medical Doctor. Dr. Paul Eneche is the founder and senior pastor of Dunamis International Gospel Center, a church he founded in 1996.
the ministry. He is married to a doctor also, Dr. Becky Eneche and they are blessed with Four Children. She is the proprietress of Dunamis International Schools. The call to begin the ministry came when he was at a cross road in his life and he was confused as to the will of God for him. Pastor Paul Eneche then embarked on a three days dry fast and went to the mountain side in Jos, Plateau State, fasting and praying for God to reveal his will. Pastor Paul was at a loss as to whether to take up an attractive appointment in the country or to step up his Medical qualifications or whether to relocate to London with his family and set up practice there as his wife is also a doctor.After the third day, the revelation for him to found the Dunamis Ministry came to him and his wife also got a confirmation of the call. Six months after the revelation, in November of 1996, he relocated to Abuja with his family and started the Ministry. Dunamis International Gospel Centre held its first Sunday service at Abuja Centre for Arts and Culture (First Floor) Area 10. The Church service was held there for 2 weeks and the church later moved to Abuja Sheraton Hotel & Towers, where the church worshiped for about 6 months. Pastor Paul Eneche then moved to its present site in June, 1997, less than a year after the ministry started. Today Pastor Paul Eneche's church has experienced massive growth and has branches all over Nigeria, Europe and Africa. 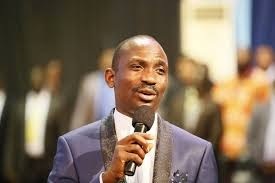 Pastor Paul Eneche is the publisher of the monthly daily devotional called ‘The Seeds of Destiny’ and also the host of the popular television and Radio series titled ‘Destiny Encounter’. He has also written many inspirational books. Pastor Dr. Paul Eneche and his wife has touched many lives through their life changing sermons, talks and seminars.